eBay Description Description This bluetooth speakers adopts latest bluetooth V4.2 technology which can pair with all types of devices with bluetooth functions in seconds. Mini size design allows you to take outside for easy carry and storage. A perfect choice for outdoor hiking, climbing and camping. The speaker transmits clear and crisp super bass sound, it's an ideal outdoor and indoor music player for you and your family, friends to enjoy high quality music anytime! 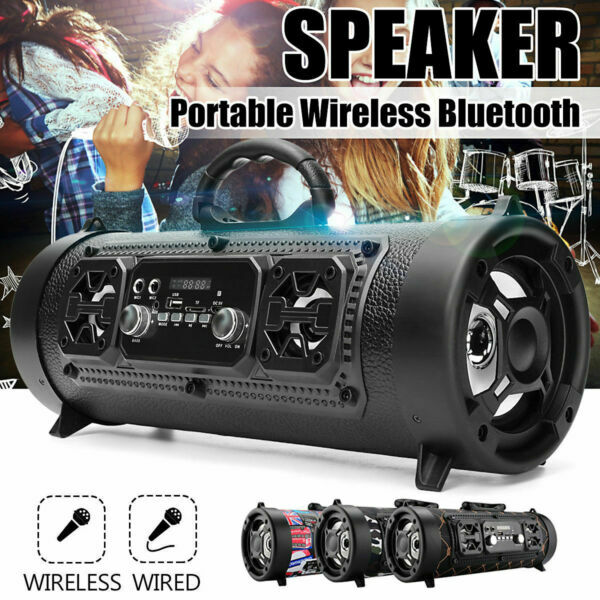 Features - Bluetooth V4.2 technology, our Bluetooth speaker can connect with your smart phones, tablets, or any other bluetooth device in 10 metres in open air. Speaker will automatically reconnect to the last device used. - Sensitive touch control enables easy operation to adjust the music playing mode, volume and more. - Enjoy a high definition stereo sound whether you're at home or party, walking, camping, hiking, biking and more activities possible. - Supports TF card and Bluetooth devices. in music playing. You can enjoy your favorite songs freely without bluetooth connection. - 2.1 stereo speaker, delivers full mid frequency, clearly high frequency and amazing low frequency sound. Specifications - Color: As shown. - Material: Plastic. - Size: Approx. 36 x 15.8 x 15 cm. - Bluetooth Version: V4.2. - Support: TF card(up to 32G, not included), USB. - Play format: MP3, WMA - Frequency range: 75HZ-18KHZ. - Speaker power: 5W. - Battery: 2000 mAh lithium battery - Input voltage: DC5V - Wireless Range: Up to 33 feet (10 meters in open air) Packing list 1 x Speaker Payment 1. We only accept PayPal, payment system supports Mastercard, Visa, Discover, American Express and eCheck. 2. Please make sure you have a valid PayPal account before bidding. 3. The payment shall be submitted within 7 days after the transaction is completed. If the payment is delayed after 7 days, we have the right to cancel the transaction and re-sell the item you ordered. What’s more, there will be UPI(Unpaid case) in your ebay account. Shipping 1. We only ship to USA. Free shipping is offered to all items. 2. Items will be shipped within 24-48 hours after payment confirmed, except weekend (Saturday and Sunday) and Chinese/USA official holidays. 3. Shipping time is different from the item location. Items located in USA will be shipped out via USPS and delivered to you within 5-7 business days. Items located in China will be shipped out via E-packet and delivered to you within 15-20 business days. 4. The items will be shipped to your paypal address unless the different mailing address is informed before or when the payment is sent. If a wrong mailing address is provided, we will not take any responsibility of it. Return Policy & Warranty 1.In our store, you will enjoy 30 days return/refund guarantee (Excluding misuse of the item and damaged item). 2.If the item you received is faulty, damaged or incorrect, or any further problems, you can return it for replacement or refund, please contact our customer service on eBay within 30 days from item received. 3.For damaged items on arrival, please contact us immediately, sending us an email with a photo is preferred. We will offer solutions to such cases. Full refund or replacement will be guaranteed.